You’ve been asking questions and are eager to see more views from the spring Lisette patterns. So here we go. We made these samples to test the patterns when we were writing the instructions, so you’ll see that they haven’t been fit perfectly to me. I hope, however, these photos will let you see some of the details and additional views or options offered in each pattern. And let’s just say up front that I’m no professional model and don’t feel terribly comfortable in front of the camera, so be gentle with me, ok? With all that said, here are the photos. 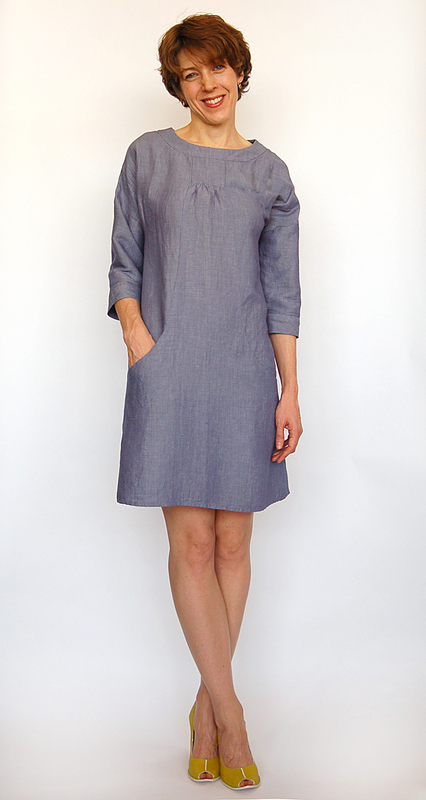 This is the Passport dress made from a heavy cotton. We were testing a few options for the darts when we made this dress, so if you look closely (please don’t look too closely) the darts are uneven. They won’t be uneven on your dress. Obviously, when I make this dress for myself I’ll need to add some length in the torso. And I don’t have much in the way of a bust, so adjustments will be made in that area, too. This Passport jacket is made from a heavy cotton herringbone fabric. Here is the Market tunic made from iridescent silk dupioni. 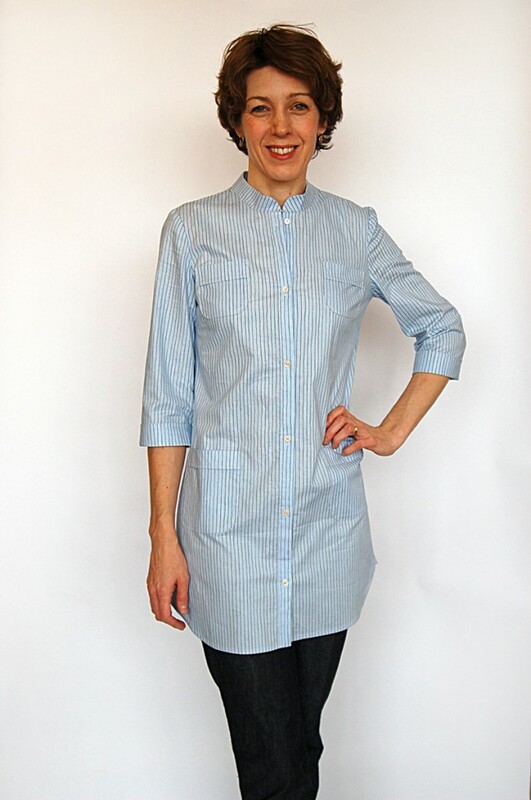 When I make this for myself I’ll add 2″ to the length and 1″ to the sleeves to accomodate my proportions. 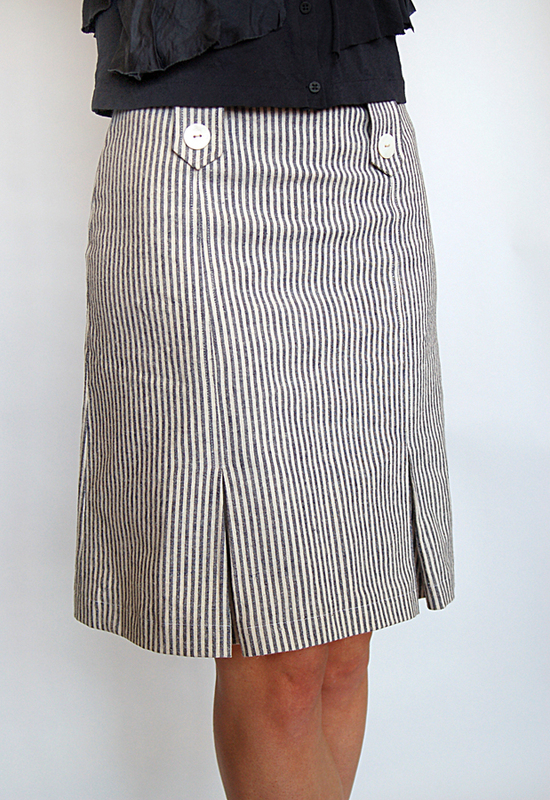 This is the Market skirt in View A with kick pleats and button tabs, made from a yarn-dyed cotton ticking. And I’ve told you I like the Traveler dress as a tunic and a dress. Here is the tunic length with the band collar, including the pockets from View A and worn without the belt. Here is View B, the more fitted dress. 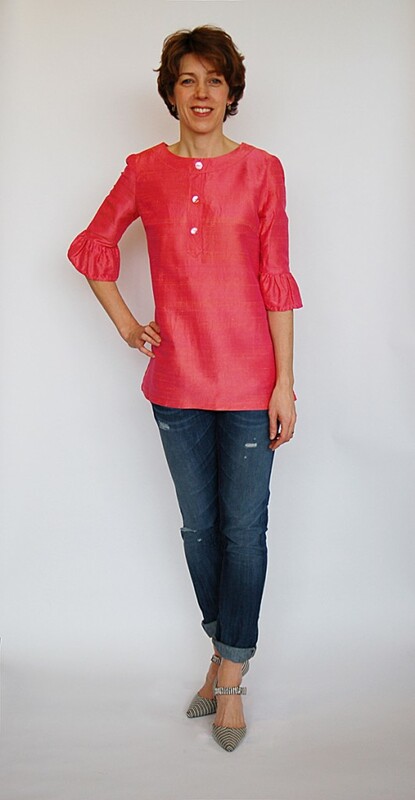 This is what I plan to wear all spring and summer: the Portfolio tunic. And here is the Portfolio dress. I hope these photos help you visualize what you can do with the patterns and inspire you to start planning some new spring and summer pieces for yourself. I’m looking forward to seeing how you make these styles your own. When you’ve sewn a Lisette style, why don’t you join those who have already started and post a photo to the Lisette Flickr group. It’s always great to see the results of what everyone is making. Thank you so much, Liesl, for posting these photos. My old eyes were straining at the pattern photos to make out the details on the views that weren’t featured. And might I add, you’re looking lovely! I really like the cotton herringbone passport jacket. The ruffle looks really sophisticated in this fabric. Oh wow,I wish I had the legs to wear my Portfolio dress that short! You look fabulous Liesl,great to see all the details on the clothing. I LOVE the passport jacket in that fabric!! I really love these pictures! These are actually more appealing to me than some of the pattern photos, convincing me to try out a couple that I was going to pass on. Thank you! And lovely work modeling! These photos are a revelation- thanks so much for sharing them. I love the fabric choices, and you make a lovely model. You look lovely Liesl and it REALLY helps to see them made up in non-lisette prints, which are lovely but also busy and but is hard to see the details. 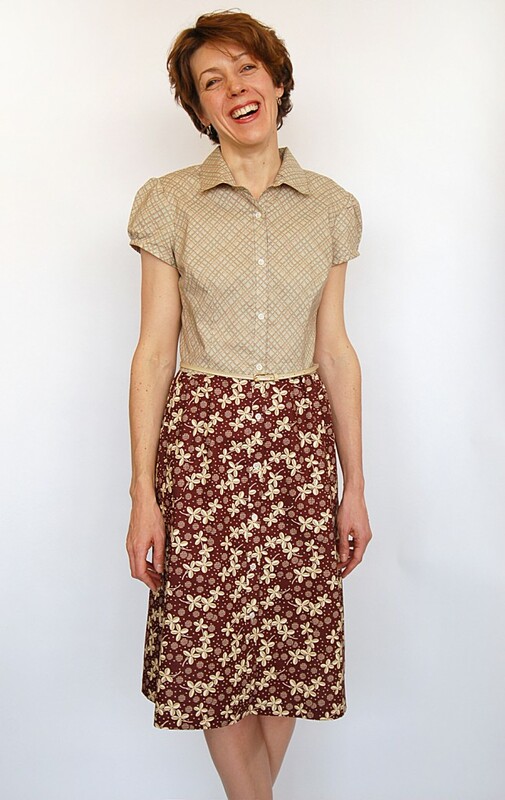 I love your color choices and many of them are closer to the earthy tones O usually pick, it always helps to see soemthing in “your colors!” Thanks again for the patterns, I just made the market blouse and I love it, will be testing/muslin another pattern soon! Liesl, thank you so much for these pictures! You and the clothes look amazing! I love the jacket in herringbone. I can see that jacket made up in a lot of different fabrics for different seasons. And the silk dupioni! My patterns arrived yesterday and I can’t wait to get started. I’ve got a pretty stack of fabrics from our recent trip to Bangkok — so happy I didn’t cut into them before lisette was announced! Now the only problem is which pattern to make first! Now THAT makes me want them ALLLLLLLL! 😉 Thanks for showing these, Liesl. And, I must say – you are just darling, beautiful, and styled. Oh, I love seeing this pictures of you in the test garments. 🙂 Very cool! Just beautiful clothes and modelling Leisl – thanks so much for posting these images. My passport and portfolio patterns only just arrived in the mail in Australia today. Looking at the gorgeous completed clothes on you in the photos – I am wishing i had of bought the Market set of patterns too ! I’ll definitely be buying that set of patterns too now. Thank you for showing the outfits on a “real” person. Honestly, I like the patterns even better. It makes me want to buy all of them now! Instead of just the couple that I did get. I was wondering how the Market skirt with pleats looks. Awesome! I want to make it for me. Liesl, you look absolutely lovely in these photos. Every single picture is total gorgeousness. Love the top, love the tunic, love the dress, love the skirt, love the shoes. Love it all! Ordering now! I want to put my little nudge in for long flowy, relaxed but young/hip dresses and skirts. You cant find a long dress or skirt in the stores that isn’t see through, Doesnt show all of your cleavage or doesn’t make you look like a grandma! I am only thirty I dont want to look like I am in the nursing home but don’t want to look like um… Well I don’t want every “tom” seeing my stuff when I bend over or am in the sunlight. I haven’t sewn one of your beautiful styles yet but it’s on my list. 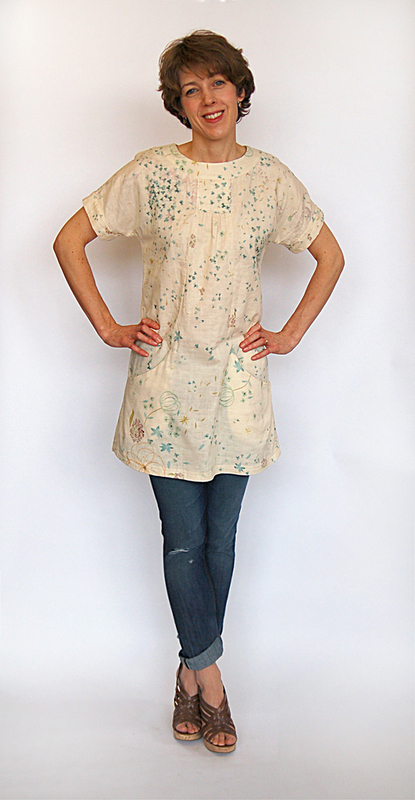 Meanwhile I used your gorgeous lawn fabric to make a blouse, and I love it. You can see the result on my blog, and I hope it’s not inappropriate to post the link here: http://slippermoonstudio.blogspot.com. I have been eying these patterns and was so happy to see that they are for sale, along with the gorgeous fabrics, as Joanns! I have coupons and now I know just what to use them on! Thank you– so helpful! I’m excited to try my own. And you look great. I really found the ‘alternative’ views of the wonderful patterns helpful in visualizing how they move in life, the different fabrics, thank you so much! However I still have difficulty imagining how these might look on me- it’s the BIG question: any chance of some pictures of someone in a large(r) size wearing them??? Pretty please? Or maybe someone could point me to a blog of someone who has made the larger pattern sizes? I can hardly wait to make some of these clothes (have bought all the patterns) and having a larger set as an ‘alternative view’ would be wonderful. Bettina, you might want to check out the photos that are starting to appear in the Lisette Flickr group (http://www.flickr.com/groups/sewlisette/). I think you’ll find the kind of things you’re looking for there. I’ve been watching the Flickr group in the hopes of changing my mind, but I remain unconvinced about the Portfolio dress. It’s very cute and I absolutely love the pocket concept, but it really only suits a straight figure. 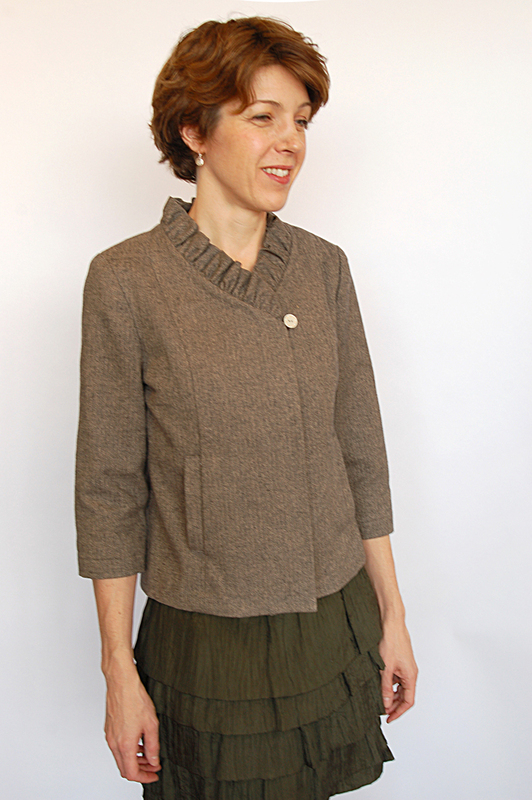 The placket detail smushes a large bosom so it appears matronly rather than attractive. Plus, it hides rather than shows off the best part of a curvy figure so the overall effect is dowdy. On a very narrow or petite person it looks quite stylish and fun. Not every dress can suit every body. So as cute as I think it is, I’ll hold out for empire waists or pencil skirts or wide legs and see what next season’s Lisette patterns bring. But man, I can’t imagine a mom out there who wouldn’t love the pockets! I do love the Passport dress and the Market skirt. They will be on my list when the baby is weaned. Thank you for these lovey new patterns! We have one pattern so far, and my sisters and I LOVE it! We want more! Love your patterns – especially the blue shirtdress with leather belt, and the Market skirt in View A! Thank you for sharing some great patterns. I’m looking forward to making quite a few of them.